Marco at Cycle Tech promised me I can have my P4 on Friday. He says he doesn't want to rush the building of the bike as it is the 1st one they are doing and he wants to make sure everything is 100%. Don't know if it is a good thing or not if I get the bike before the weekend. You know how it is when you get something new, you just want to use it. You see Saturdays are my Long ride day and with the Bronchitis out of the system, but me not 100% I would want to do my long ride but I know it won't be a good thing to just jump back at it and go long. But to say I am going out for an easy 1 hour ride, I will be lying to myself. Haven't been so excited in a really long time, like a kid the night before your Birthday or Christmas. Maybe that is also the reason I am finally feeling better and are not coughing and running out of breath all the time. It is amazing how ones body react. On Monday I was better but still coughing and feeling bad and then suddenly on Tuesday I felt like a different person. Now the long road of getting back to my fitness levels that I had three weeks ago starts. I just need to be patient and not push it to hard, will do an easy spin on the Computrainer tonight and will be back at the Gym tomorrow for my gym session. Luckily this is not high aerobic but I think I am going to feel it in the muscles on Friday morning after not being in the gym for three weeks. Now it's like old times when I was very young and I counted the nights before my birthday when you know there is something happening and waiting for you. My mom has been sick for a while, also. She got the 2010 scott plasma, and now she is like a whole new person, now that she has gotten something new, a super sweet bike can totally help. Hope you get better, and have fun with that new bike on Friday! Thanks I am feeling better and can't wait for Friday. Wow your Mom's bike must be awesome, will it become your bike later? I am so jealous! 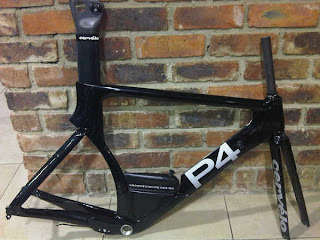 Please let me know how you like the P4 as it may be my next bike too!!! Hope to see you in Kona.